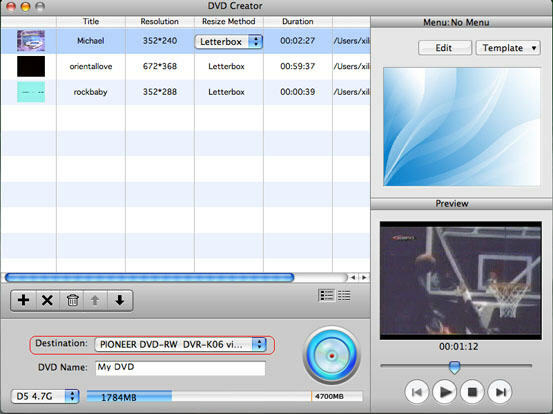 This page will show you how to burn Mpeg DivX XviD WMV ASF MP4 AVI to DVD on Mac step by step with DVD Creator for Mac. Step1. 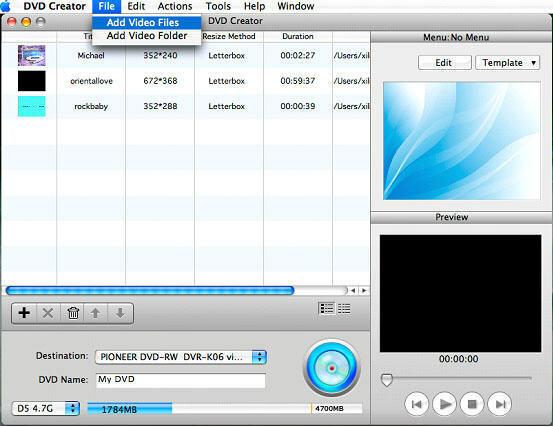 Please download DVD Creator for Mac and run it on your Apple computer. Step2. 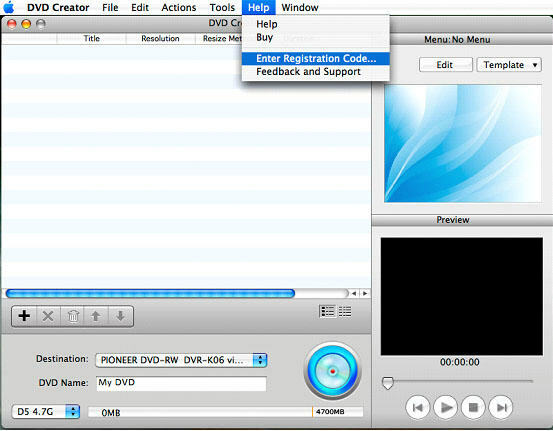 Run the DVD Creator for Mac and add registration code in the "Help" button. Now, you can convert your DVD at any time. Step3. Add files that you want to convert. Here are two ways. One is to click "+" in the main interface, the other is to click "Add Video Files" option in the File menu. It can create DVD from AVI, MPEG, WMV, ASF, DV, DivX, XviD, VOB, 3GP, 3G2, MP4, NUT, YUV, H.264, M4V files. 1. You can also add ISO files or DVD folder under "Action" menu. 2. There are three Resize Methods you can pick, "letterbox", "Pan and Scan" and "Full Screen". 3. 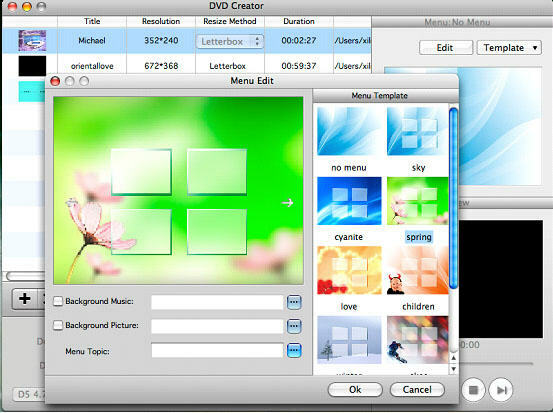 More optional preferences you can set under "DVD Creator" menu, such as choosing the video format, quality and so on. Step4. Set Menu topic, background music and picture by clicking "Edit" button on the right of the main interface. Step5. You can preview your DVD now before creating DVD. It's awesome, right? Step6. Click destination to choose the output file you want. The default method is to make a DVD Disc, but you can also save your videos as ISO file or DVD folder. Step7. Burn your DVD at once. Just click the round circle button on the main interface. Tips: In this case, Detailed process and Total process will be shown on your Mac, don’t worry about it, the software is busy converting now, wait a moment to see your great job. How to convert iTunes DRM protected music to MP3 AAC AIFF WAV on Mac with DRM converter for mac?